When a historic artwork enters our collection, it’s the first clue in a grand investigation. A painting is a concrete piece of evidence that links to the artist’s evolutionary chain, leading us back through the years. Eric Sloane’s Hopi Country, pictured above, helped us trace its creator from New Mexico to his hometown of New York City. Along the way we met three of Sloane’s mentors, who are all revered figures in American history. Eric Sloane was born Everard Jean Hinrichs in New York City in 1905. Meanwhile in Chicago, Sloane’s future mentor Frederic W. Goudy was experiencing a late-in-life rebirth. At 40 years old, he had quit his job as an accountant to open a publishing house called Village Press with his friend Will Ransom. He learned how to design typefaces and began building a portfolio. “[Goudy started] almost from scratch at an age when most men are permanently set in their chosen vocations,” wrote Popular Science in 1942. Goudy’s new path would lead him from Chicago to Boston to New York, where he moved in next door to young Sloane. As Goudy’s career took off with a series of hit typefaces—Kennerly Old Style, Goudy Old Style, Copperplate Gothic—young Sloane learned the tricks of the trade. Goudy would design 122 typefaces in his lifetime, topping Gutenberg and Garamond. His painting lessons for Sloane soon launched one of the great adventures of the budding artist’s life. But first, a scholarly interlude. Sloane changed his name while studying at the Art Students League of New York. He took the middle letters of “America” for his first name, and tweaked the surname of his mentor John Sloan. Sloan encouraged his students to adopt pseudonyms in order to sever ties with their earlier, less accomplished work. He was a passionate and sometimes volatile teacher who believed in art for art’s sake. “I have nothing to teach you that will help you to make a living,” he would tell his students. Although he was a well-known artist who participated in groundbreaking exhibitions like the 1913 Armory Show, his artwork rarely sold. Sloan’s circle came to be known for their realist depictions of poor neighborhoods in New York. Sloane never took to this subject matter, but finding a new name was transformative for the young artist. With his patriotic moniker and the skills he’d picked up from Goudy, he took off across the country in the summer of 1923, painting sings on barns and stores to make ends meet. Two years later he took another, longer adventure to New Mexico, one of Sloan’s favorite vacation spots. Much like other students of Sloan, the light and colors of the New Mexico inspired Sloane to push his art in a new direction. He picked up oil painting and learned to capture the light, color and endless expanses of the High Desert, and returned to Long Island in 1927 with a new sense of purpose. Sloane grew up during the Golden Age of Aviation. By 1933, his fascination with aircrafts lead him to a job at the Half Moon Hotel, which was close to Long Island’s Roosevelt Field. The aviators who stayed at the inn became some of Sloane’s first patrons, paying him to make oil paintings of their planes. Aviator Wiley Post was so impressed by Sloane’s work that he offered to swap flying lessons for painting lessons. Post had trained to be an aviator during World War I, but the war ended before he entered active duty. He worked as a parachutist for a flying circus and a barnstormer before becoming a private pilot for wealthy Oklahoma oilmen. The job earned him enough money to set out on a worldwide adventure, and he became the first pilot to fly solo around the globe. Sloane was so inspired by his flights with Post that he began painting the sky, as seen from the cockpit of a plane. Amelia Earhart bought the first work in this new series, and one of Sloane’s largest cloud paintings is now in the permanent collection of the Smithsonian Air and Space Museum. At 28 years old, Sloane had grown from an eager student to a full-fledged master. Sloane started painting landscapes in the style of the Hudson River School, a mode that fit his fascination with turbulent weather. Beginning in the 1950’s, he took up residence in Taos for part of each year. He built a home in La Tierra, New Mexico in 1975. Sloane captured the light and color of the Land of Enchantment with boundless enthusiasm. Hopi Country features every brilliant hue in a Land of Enchantment sunset. It’s quite a tale, and it all unwound from a single oil painting on our wall! Learn more about Eric Sloane on our website, and make sure to connect with us on Facebook, Twitter and Flickr for daily gallery news. Keller is the general manager at Santa Fe’s oldest restaurant and cantina, and we’re on a hunt for a particular ghost. Alfred Morang (1901-1958) often haunted the establishment in his years among the living. This Thursday, El Farol and Matthews Gallery are throwing a special toast to his lingering spirit in the cantina, where Morang painted a series of stunning murals. The event will christen our December 12-26 exhibition MORANG AND FRIENDS, which features rare artwork and artifacts from the man who was known as Santa Fe’s Toulouse-Lautrec. When you enter our rustic cantina, one of the first things to catch your eye will be the beautiful murals displayed throughout. The first artist to grace our walls was Alfred Morang. On the long west wall of the bar and one behind the bar, are our oldest murals were painted between 1948 and 1952. Mr. Morang was already an established artist when he frequented El Farol during that period. He painted the murals to settle his tab at El Farol. The scenes are of local landscapes and adobe homes in Santa Fe. We’ve chosen to reproduce our most famous mural of the flamenco dancer in the red dress accompanied by a guitarist as our poster for the 2004 Muralist dinner. From 1968 to 1980 the owner at the time covered the murals with paneling. When Bob Ward purchased El Farol in 1980 he removed the paneling to discover the beautiful murals beneath. When David Salazar purchased El Farol in 1985 he was always mindful of the treasures on the walls. Painting, re-stucco and remodeling were completed while protecting the murals. On Easter morning in 1997 David and the staff were awakened by phone calls that El Farol had been burned. The murals, though singed, had made it through the fire. Morang died in a 1958 studio fire, so the news that some of his most notable works survived a blaze decades later is eerie to say the least. We walk over to the cantina to view the murals. When the hostess hears us mention Morang’s name, she lights up. El Farol has long since been restored to its elegant Old West aesthetic, much as it was when Morang would stop by for a shot of cognac and draw inspiration for his impressionistic paintings of Santa Fe’s wild 1940’s nightlife. On Thursday at 6:30 PM, Keller will join the gallery staff to tell stories and toast the artist with a new “Alfred’s Special” cocktail. “I read up on Morang and learned that he was born in Maine, and how beautiful the landscapes are there,” says Keller. “He did a lot of painting there. His first inspiration was that landscape.” Keller selected a cocktail called Remember the Maine (with rye whiskey, Cherry Heering liqueur and a splash of absinthe) in honor of Morang’s home state. Come have a drink and time travel with us to a true Santa Fe golden age! Learn more about our Toast to Morang event on the El Farol website and on our gallery homepage, and connect with us Facebook, Twitter and Instagram to learn more about Morang. When John Sloan invited Beatrice Mandelman and Louis Ribak to visit Santa Fe in 1944, the two artists were on the rise among New York City’s avant-garde. 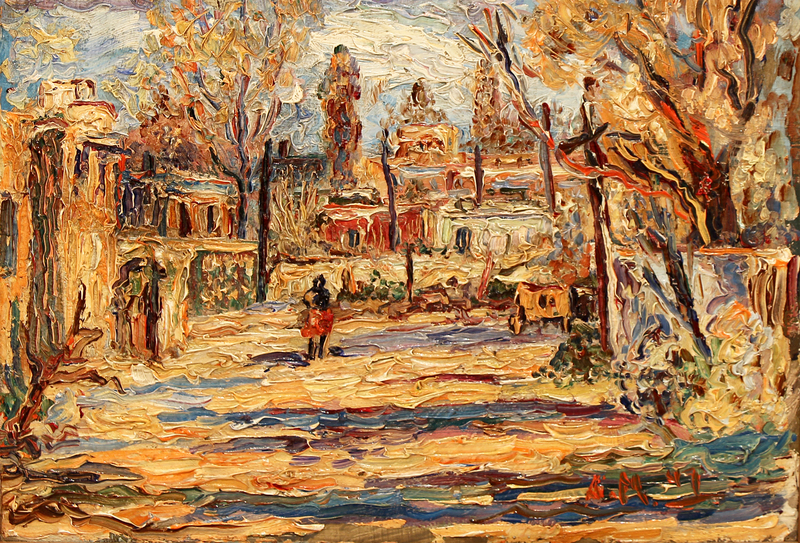 They had ties to Hans Hoffman and Fernand Leger, and were often mentioned in the same breath as Jackson Pollock. Sloan, who had been summering in New Mexico for years, had a reputation for spiriting away his favorite artists to the Desert Southwest. During their trip the recently married duo took a train to Taos and decided to stay. The move marked a radical change in Mandelman and Ribak’s artwork. “We had to start all over again,” Mandelman said. “We spent the first couple years painting landscapes.” They were known for their figurative paintings in New York, but in this radically different environment their focus shifted to pure abstraction. They were trailblazers for a new wave of artists called the Taos Moderns, a movement that enlivened the Taos art colony but enraged an older vanguard of academic painters with ties to the Taos Society of Artists of the 1910’s and 20’s. To this tight clique of romanticists, the newcomers stuck out like colorful cacti—particularly Mandelman. 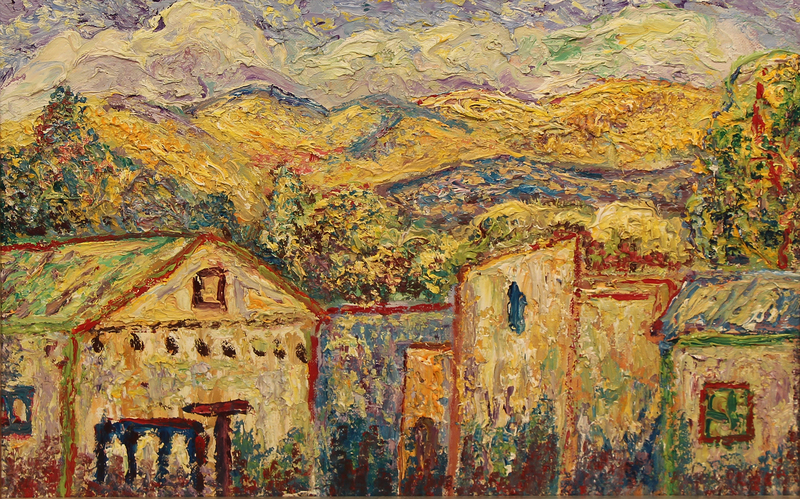 “She worked with full abstraction at a time when most artists were not daring enough to do so,” writes David L. Witt in his book Taos Moderns, noting that Mandelman considered herself “the first of the second generation of artists in Taos.” The voice of a young, female abstract painter had never been part of the remote art community. Far from the big city, Mandelman developed a new appreciation for the natural world and humanity’s relationship with it. By the late 1940’s she was developing an abstract symbol system to express her emotional responses to the landscape. Her elegant compositions didn’t mimic the lines or palette of the high desert, but they perfectly evoked the strong, solitary spirit of its inhabitants. 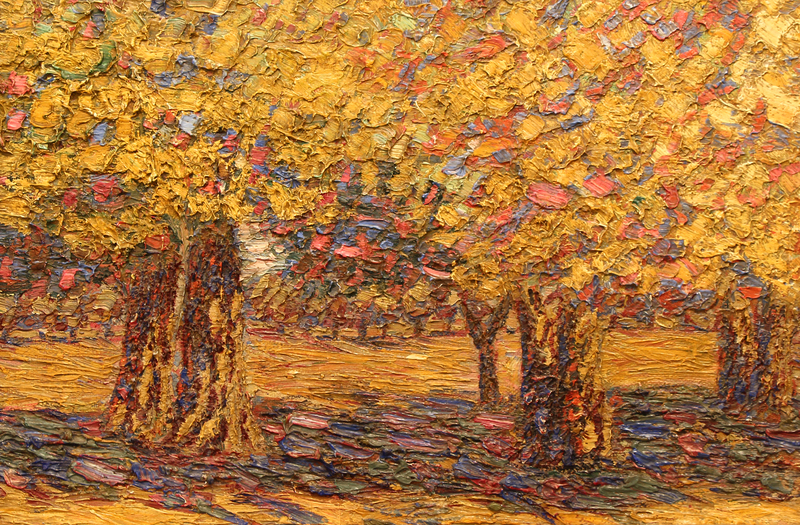 The mixed media painting in our collection was likely done in the 1950’s. Early in her experiments with abstraction Mandelman chose a muted palette, but here brighter colors poke through. This more expressive style was inspired by Henri Matisse and Mandelman’s former teacher Leger, and allowed her to explore the highs and lows of human experience with great vigor. Cool Wind‘s undercurrent of chilly blues and bright accents of orange and red call forth the sensation of a shiver passing up the spine. As the evenings get cooler in Santa Fe, we’ve developed an ever-evolving passion for this piece and the innovative artist who created it. Learn more about Beatrice Mandelman on our website, and connect with us on Facebook, Twitter and Instagram for daily gallery news.